As we were leaving to run errands yesterday morning we an exciting discovery! This little guy and his mode of transportation were parked right in front of Snowflake's house! Naturally we wondered where he came from so the girls checked the mailbox and found this note. They promptly wrote him a note back saying he is more than welcome to stay for as long as he wants and they believe he will make a perfect grounds keeper. Have you ever wondered how you can change the world? Most of us want to make a difference but the world is a big place and human beings are complicated. How can I expect to make a difference on a global scale if I can barely get my boys to mow the lawn? For those of us who want to make a difference, it's natural to think big. But what if the smallest acts bring about the biggest changes? 249 Cranberry Lane-How to make a home a home! The fairy excitement around here grows a little stronger everyday. After visiting Gardner Village to see other fairy dwellings the girls have started to wonder who Snowflake might know or be friends with. They have even checked out fairy books from the library. When our fairy house appeared the girls had questions and the list gets bigger as the weeks go by. So today we thought it would be great to put together a little book of questions with room for Snowflake's answers. The girls want to know things like whether or not Snowflake knows Tinkerbell, Zarina and/or Periwinkle. They are most excited to find out what day Snowflake's birthday is! Vivian is convinced that Twanda Bell needs to invite more friends to live in our neighborhood and she is going to do everything she can to make it happen. She started with a note to Twanda telling her what fairies she still needed to live nearby. 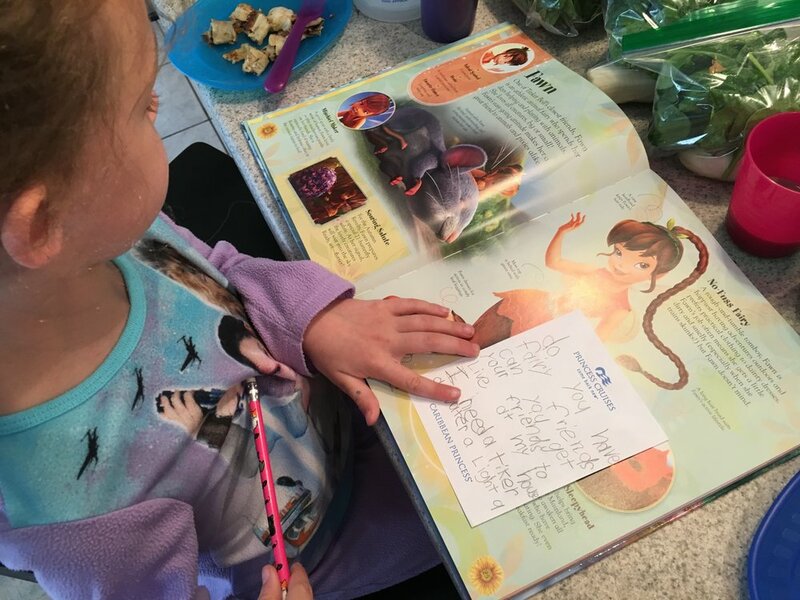 Pouring over the fairy encyclopedia during breakfast while writing notes to Twanda "do you have fairy friends, can you get your friends to live at my house? I need a Tinker, a Water, a light and an Animal Fairy." Next, She begged to go to the fairy house workshop to see the new homes being built and ask Miss Robyn if there were any fairies looking to relocate to our neighborhood. She then decided that if we really wanted to have another fairy move in, we were going to need to put in a little work and make some space for her. I think I heard "If you make a space, the fairy will come" more than a hundred times. So we set to work on the gravel patch out front. We needed to make the perfect place for a new fairy to live and it needed to look "more inviting". We called the local blue stakes to make sure any fairy house excavation would be safe and after they made some pretty orange marks, we were ready to clear out the gravel. We built the dirt into a little pile with a flat space on top for a house and crossed our fingers that a new fairy would think it was the perfect place to call home. The next day we were surprised to find a new sign had magically appeared. Maybe she's right. If you make a space, magic does happen. I often hear overwhelmed parents commenting about Elf on the Shelf, Leprechaun traps and things they don't want to start because they don't want to have to continue it. It's just one more thing to add to their "to do list". Now, we've invited fairies that aren't even holiday centered, to be around EVERY SINGLE DAY. Why would anyone do this? Isn't there enough to do? Who has time for that? Me, and I'll tell you why. Nine times out of ten my house is a disaster, I'm exhausted, and I should probably spend my few spare minutes picking up rather than cavorting with fairies, but I'm raising believers. They are curious and creative, full of imagination and joy. They fabricate the most unbelievable stories for me. The line between real and make-believe is hazy at best, but they BELIEVE with all their little hearts. It's amazing how quickly tired melts into enthusiasm and how my bloodshot eyes can find joy in the happy disaster that surrounds me. I get caught up in all of the magic and fun. What did Twanda say today? Do you really think she can bring pixie dust? Will we be able to fly? What do you think fairies like for breakfast? Can we make her a present? Maybe we should share some of our cookies. I came to my kitchen one day to find the entire sliding glass patio doors covered in melted crayon and a joyful two year old and her six year old sister grinning at their creation. "Look Mom!" they cried, happily pointing out the six feet of windows covered in gloppy mess that I was going to have to clean. Amidst the gooey mess was a picture of a fairy with a note above it. "Vivian believes in fairies!!!!" I celebrated their artwork with them, gushed about how beautiful it was and then set to work scraping it all off. So they could "do it again sometime," I told them. I couldn't bring myself to erase the fairy, she still looks over our kitchen proudly proclaiming that "Vivian believes in fairies"
While there are mornings that in my tired stupor I hear the girls stirring and panic about whether the fairies wrote back, dashing to the fairy mailbox wearing my pajamas to check, I wouldn't trade it for the magic that lights up their faces when they discover the tiny letters with their names on them. Their favorite phrase is "I have an idea" and it is usually followed by something outlandish that they are sure I can figure out a way to accomplish. They don't ever question if things are possible or not. They just tell me what it is, expecting that it will happen. I am always impressed with their creativity and intimidated by their plans but I have come to learn over time that it's their belief that keeps me working, learning, and growing. They believe and I get to play a very small part of that magic. It's not easy to make pancakes in the shape of fairies, or any of the other "ideas' they conjure regularly and while I constantly worry about whether the fairy has written or not, the memories that have been created have far outweighed any inconvenience. These days are short, and I only get to be a part of their magical childhood once. Their belief in fairies may not last forever but I hope these memories will. So while my home is not the cleanest on the block and I still get far too little sleep, I choose to make time for the fairies. My girls are believers and that is more than enough reason for me. 249 Cranberry Lane- SURPRISE Alice!!! So Alice has had a pathway for quite some time now but every few days the rocks kept coming out and getting miss placed. So my kids and I decided to surprise Alice with a new, more sturdy pathway!! We had so much fun doing this for her! And what was even better was the letter we got from her! We learned once again that when you serve others it brings YOU so much LIGHT & JOY! What can you do for someone else this week?? 249 Cranberry Lane- Meet Alice's new Janitor! I dont know if any other Fairy's have aquired themselves a janitor but ALICE sure has! Everyday this sweet girl checks on the inside to make sure its all clean and that everything is in place and then sweeps the stairs! She even makes sure the fire pit is in its place and makes adjustments to the benches. I think I might ask her to come into my house and help me out a little! Lucky Alice! 343 Rebelberry Lane - Painting Day! A few days ago we received a little, tiny note in our mailbox. It was from the fairies! It said they "LOVE their new home but want to do some painting. And although they are quite strong, it would be very helpful if we would take all the furniture out for them". Of course we did and could not wait to see what these sweet fairies came up with. Here is their newly painted home and a helper putting the furniture back in for them. It's ADORABLE! I want these floors and wall color in my house! 249 Cranberry Way- Alice is the best! Our sweet fairy takes care of her human friends! This sweet girl always checks on Alice's House every day and often leaves notes for her. Today this this lucky girl got a reply! Some days there is just a quite closing of the sliding door and two sad little girls come slowly back and climb in bed with me to cuddle. "Twanda must be out on an adventure," they say with pouting faces. But that wasn't today..
Today they ran in squealing. There was happy dancing and racing around our house in circles. As they ran through the kitchen, dining room, front room and back through the kitchen again I saw Vivian waving the curled pink note. Violette was trailing behind her, not entirely sure why they were so excited but happy just to be part of the action. "Twanda wrote back!" she sang over and over while she skipped around me. She then rummaged through our kitchen drawer and sat down at the kitchen table. 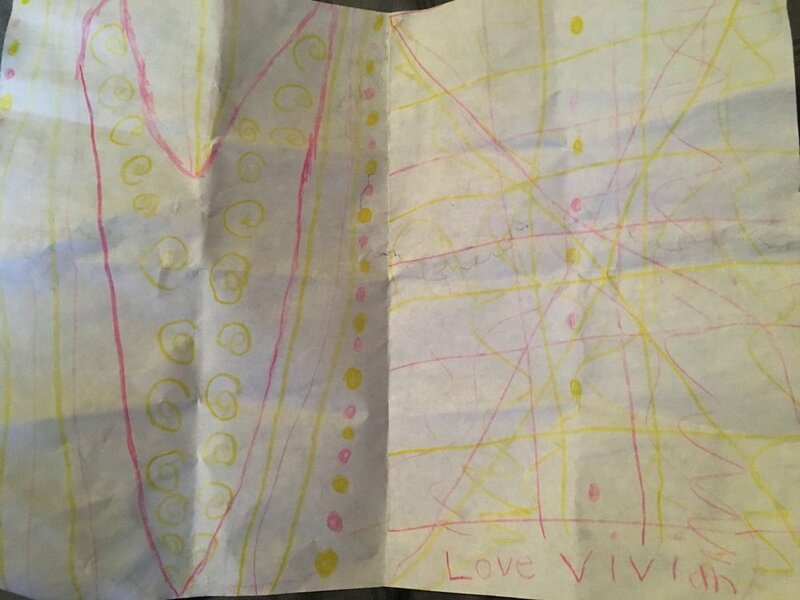 While Vivian was eagerly drafting her response on any scrap piece of paper she could find I read Twanda's letter. Oh yeah! I always forget that Tinker Bell is kind of famous in the human world. I'm going to see if she can come to visit this summer and see my new house. Maybe I'll see if she can bring something for you. I don't know all those other fairies very well. I'm not related to them but they seem really nice. Except Vidia - she's kinda mean. I think she must be sad about something. That's always what happens when fairies are mean. I'm going on another adventure for the next few days to a place called Arizona. They say it is really hot and they have lots of cactus. I can't wait to go on a new adventure. 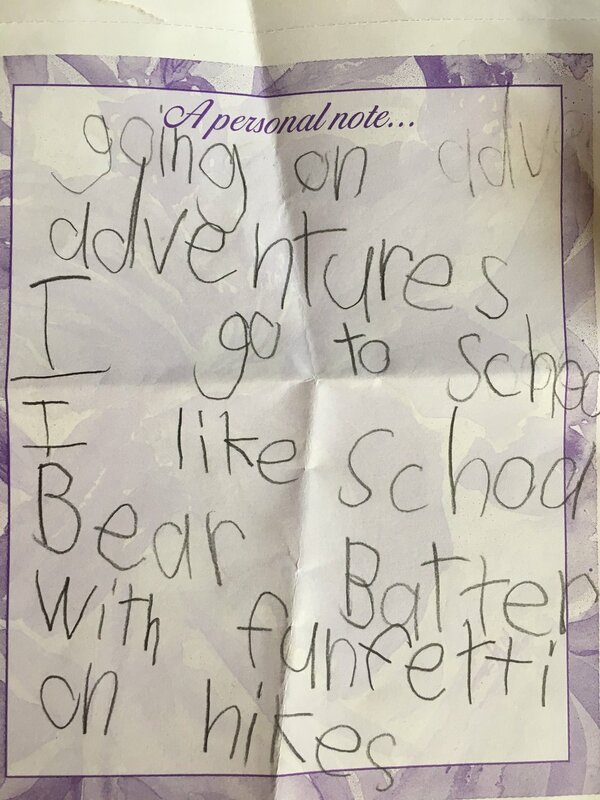 Do you like adventure? Where do you and your family like to go? If it were up to Vivian, our entire yard would be filled with homes for new fairy friends. Seeing how much magic and joy it brings to my sweet girls, I would be happy to welcome them here too! On our Make Something Monday the kids and I took a little trip to Hobby Lobby and found some items that were just perfect for Snowflake's house. We thought she might like a rug under her table and chairs so we found some fun felt and trim and busted out the glue gun. The kids thought she might like a teddy bear for her bed as well as a clock for her nightstand so we grabbed those too. Hobby Lobby has quite a variety of glass jars and vases and we bought a cute tiny one to put some pink flowers in (that I already had in my stash--I knew they'd come in handy one day!). I have a feeling Snowflake is going to love the updates! 249 Cranberry Way: We got mail!! This is one of the reasons we LOVE fairies living in our yard! "To: Alice... What is it like being a fairy? And what so you look like? And what is it like looking over the Clark's? Here is a picture of me->.. Love, Charlotte." Hopefully Alice writes back soon! 921 Cranberry Court: The Pinwheel Project! It was heartwarming to see our garden bed go from empty to full of pinwheels for The Pinwheel Project! There was some serious good deed reporting that day. Snowflake left a flower pot full of treats next to her mailbox and each good doer took one as they left a note telling her what they had done for someone else. I sneaked a peak at the notes left for Snowflake--some kids helped and served in their own homes, others visited a care center. We had kids of all ages particpate and I am just sure Snowflake loved reading her mail this week ❤. An animal fairy! I love animal fairies. I should tell you about all of the amazing animals I get to meet on my adventures. Sometimes I wish that I was an animal fairy because you guys have all the fun! I'm so sorry that I didn't write back sooner - I was at the Grand Canyon! Have you ever been there? It is so beautiful? There are tons of lizards. Do you like lizards? How do you know Tinker Bell? She is my second cousin! I think we are going to have a reunion this year and so I get to see me whole fairy family! Do you ever have reunions? Thank you for dinner! That was so amazing! I'm going to see if I can get more fairies to come and live at our address. It's so pretty here and you guys are so nice. I'm still working on finding a drawing fairy for a picture of me. But I can tell you that I have blue hair and lavender eyes. What color are your eyes and hair? Tinker Bell is on TV and in books. My eyes are blue, my hair is brown. I love lizards. I can teach you to be an animal fairy. I go on reunions. Do you know Silvermist and Irridessa and Fawn and Rosetta and Vidia and Periwinkle and Lizzy? Seems the fairies have made a few friends, this one watches over them. He found a nice flower to perch upon and watches the house when the fairies are gone. While anxiously awaiting the return of Twanda, Vivian and I decided to go and visit the other fairy houses in the neighborhood. We were at 249 Cranberry Way talking to Jenny and admiring the cute landscaping that surrounded her fairy house. The summer sun was starting to set and the light was falling in a warm glow around us. Their was a touch of magic in the air as we watched the girls explore the house and chatter about its inhabitant. I love to hear them talk about the fairies, musing about where they are and what they are doing. I was secretly eavesdropping on them when out of the corner of my eye I saw a blur of movement near some tall purple flowers. Vivian jumped up and shouted "Did you see that?" "Yeah, I did, it must have been a hummingbird or something" I replied. "No Mom! It was a fairy! I saw it! It was beautiful. It was golden and sparkly with glowing wings." She answered. My skepticism kicked in and I asked, "Are you sure it wasn't a bird, or a flying insect. I'm pretty sure it couldn't have been a fairy." "NO MOM!" She emphatically replied. "It must have been a fast flying fairy. I didn't see her very well because she was going so fast, but I did see her wings and her pixie dust sparkling. I know it was a fairy! I can't believe it, I saw a real fairy! I am so lucky!" We returned home, Vivian skipping beside me, marveling at her incredible luck in seeing a real fairy. While I put her to bed I couldn't help but think about her innocence. If ever there was a girl who believed in fairies it is her. I normally see life through the dark lens of adult skepticism but she opens my vision to a whole new world with her innocent magical beliefs. I can say one thing for sure, while I'm not 100% sure fairies exist. I do know beyond a shadow of a doubt that their magic does. It lives in my house and blesses our world with its beauty, excitement and joy; for that I am grateful. Vivian found the perfect tiny plate and made dinner for Twanda Bell. A strawberry, some grapes and a candy for dessert. She carefully placed it in the fairy house. She knew Twanda would probably be hungry after all that travelling. She ran out to check this morning and to both of our horror, no Twanda had come last night. Instead a trail of tiny ants had invaded and started feasting on the fairies dinner. She quickly rescued it, washed it off, put it safely in a zip-lock bag and returned it to the house. We assured her that Twanda was probably just out on an adventure and that she would come back soon and tell Vivian all about her latest trip. Here's hoping Twanda returns tomorrow! "She's here! She's here! SHE'S HERE!!! She took my notes AND she left me this note!" Vivian squeeled as she jumped up from looking inside the fairy house. She was waving a tiny piece of rolled pink paper. Oh my gosh! I am SO excited to finally meet you! News went out on the fairy net that a new house was coming and I have been dying to move in! This is SO great! My name is Twanda Bell and I am an adventure fairy! That means that I get to go all over the world and see such amazing places. I just got back from a month long excursion to Thailand! (you should totally look it up-it's so pretty!) I will always tell you where I go so you can look up pretty pictures. So exciting! Anyway- I love love love the new house and I can't wait to move all my new stuff in and get to know you better. Do you have brothers and sisters? What is your favorite thing to do? What is your fairy talent? By the way (BTW)- I love your wishes. Together you and I are going to make them all come true. This is SO great! So excited to be living here! P.S. I am not very good at drawing but maybe I'll ask one of my drawing fairy friends to help out with a picture of me- so awesome! 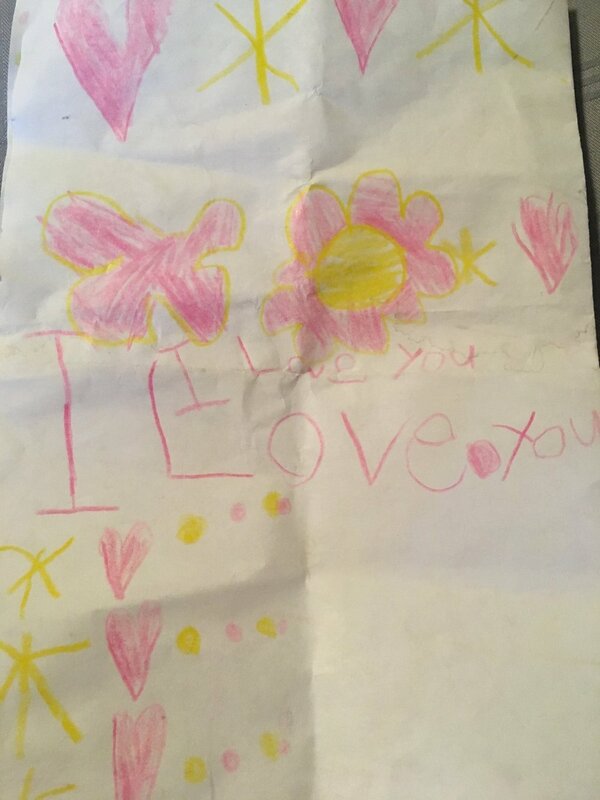 Vivian quickly responded in a note of her own. So it seems we have an Adventure Fairy moving in. So excited to share in her adventures, wonder where she'll tell us about next. In the meantime we are off to google pictures of Thailand. A handful of pixie dust and a heart full of wishes welcomed our fairy to Hop City. To make sure the fairy knew she was loved and welcomed, Vivian made her a special card and placed it in her home. 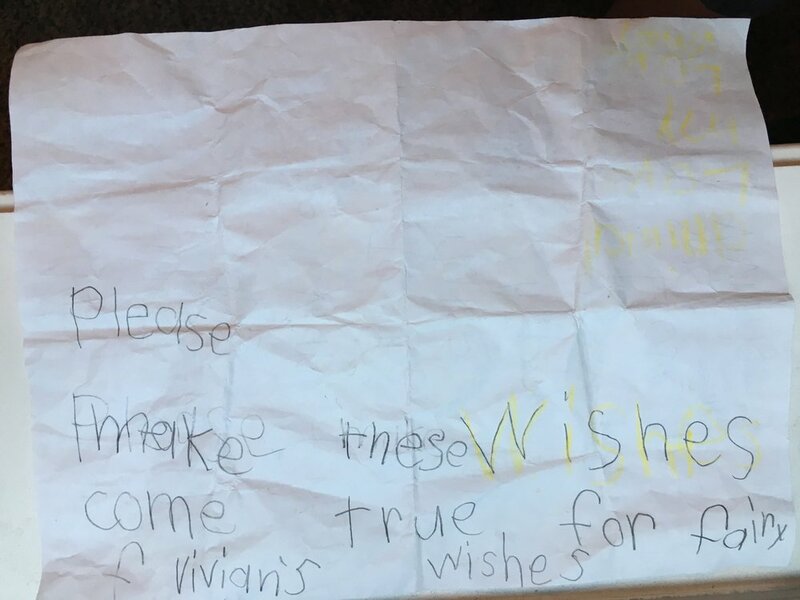 She may have been confused as to whether it was a fairy moving in or her Fairy Godmother so she also included a list of wishes she hoped her fairy would help her with. The following is a slightly clarified version of her letter.